that the new Google Contacts is available for preview from the Admin console. By enabling the preview, administrators can allow their users access to the new Google Contacts, along with the many benefits that come with it, like a new fresh look and improved contact merge features. 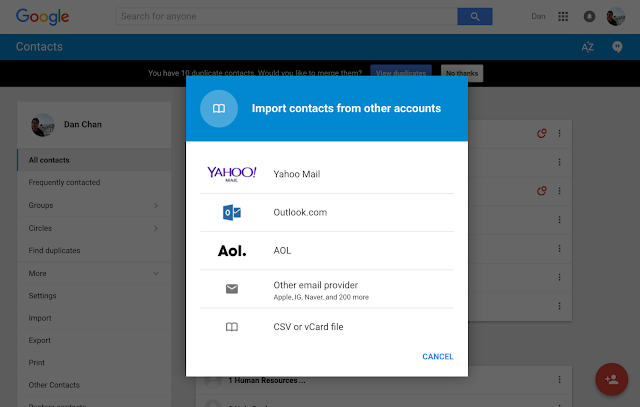 One popular request from Google Apps users was the ability to easily import their contacts into Google Contacts. We’re happy to announce that starting today, the ability to import contacts, powered by ShuttleCloud, is now available for Google Apps users. Users can now import contacts from a wide variety of supported mail and contact sources. From the new Google Contacts preview, simply click More > Import > and choose the account that you’d like to migrate from. You will be prompted for that account's username and password, and your contacts will start transferring once you have successfully granted authorization. We recently announced that the new Google Contacts is available for preview from the Admin console. By enabling the preview, administrators can allow their users access to the new Google Contacts, along with the many benefits that come with it, like a new fresh look and improved contact merge features.